Friday, June 8th, 2012 at 4:17pm. Friday nights at the Tiki at Evergrene are more fun than ever now that local musician Geoff Livingston will be playing his guitar poolside, starting at 7. The Tiki at Evergrene has become the place to be in north county for residents and their guests. The food and libations are wonderful and affordable, and the ambience is laid-back and sociable. 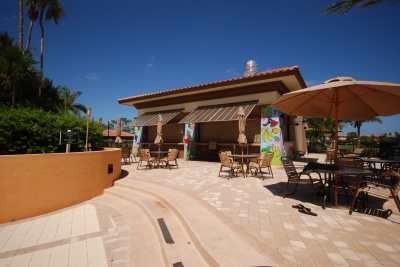 The outdoor tiki bar and its live music are among the many attractions within Evergrene. Evergrene homes for sale also come with use of a large clubhouse filled with year-round activities, a fitness center with top-of-the-line equipment and a serene, sparkling lake with a path encircling it. To see the amenities at Evergrene, click here.